* Dit is het aanbod van Crown of Convergence uit Ravnica. Als een kaart in meerdere series zit kun je die apart aanklikken hierboven. Klik op de getallen om direct naar iemands collectie te gaan. De leden die het meest recent zijn ingelogd staan bovenaan. Leden die meer dan 14 dagen niet zijn ingelogd worden niet vermeld. anders had er iets bij gestaan als: use this ability only once each turn. As long as the top card of your library is a creature card, creatures you control that share a color with that card get +1/+1. GW: Put the top card of your library on the bottom of your library. A colorless creature on top of your library never gives a bonus, and a colorless creature on the battlefield never gets a bonus. 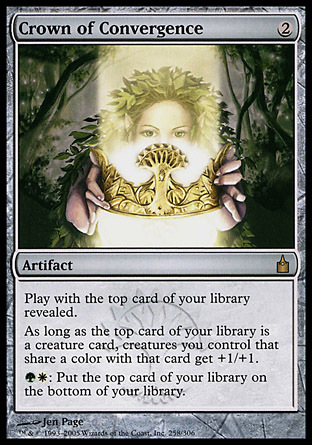 The top card of your library isn’t in your hand, so you can’t suspend it, cycle it, discard it, or activate any of its activated abilities. If the top card of your library changes while you’re casting a spell or activating an ability, the new top card won’t be revealed until you finish casting that spell or activating that ability. When playing with the top card of your library revealed, if an effect tells you to draw several cards, reveal each one before you draw it. We hebben alle decks op de site voor je doorzocht en gekeken welke 20 kaarten het meest met Crown of Convergence samen worden gespeeld.